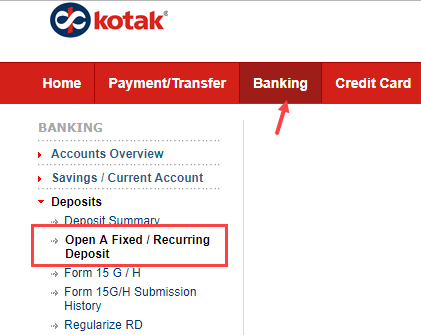 Kotak Bank customers can open RD account online using Internet Banking and mobile banking. Kotak Recurring Deposit gives you the freedom to choose a Term & Amount you wish to invest every month and earn Guaranteed Return at the applicable interest rate. 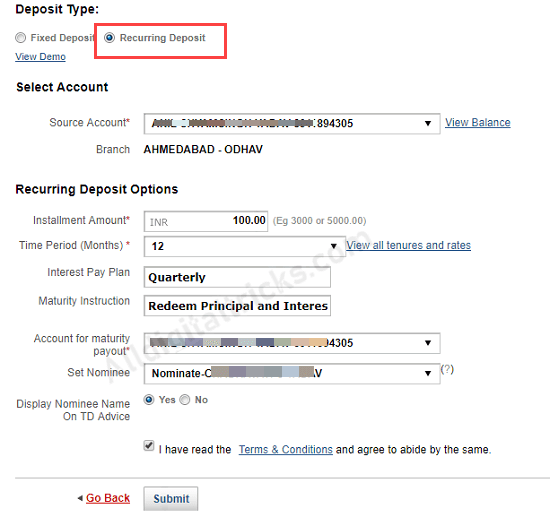 You can open a Recurring Deposit in Kotak Bank with minimum of Rs. 100/- per month to Rs. 25, 000/- per month for tenure up to 10 years and Rs. 1, 00,000 for tenure up to 36 months. 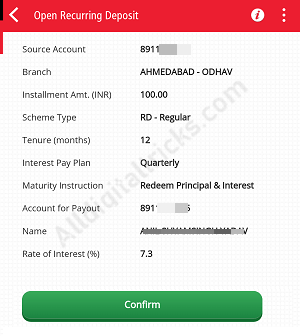 Here we will tell you two methods, how to open RD account online in Kotak Mahindra Bank. 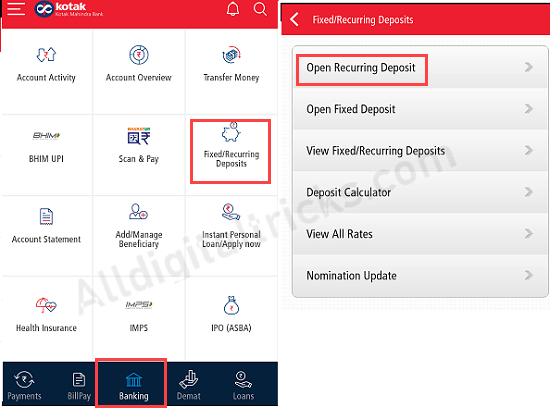 Login to Kotak Mobile banking app. After login, click and open Banking tab and select Fixed/Recurring Deposits. 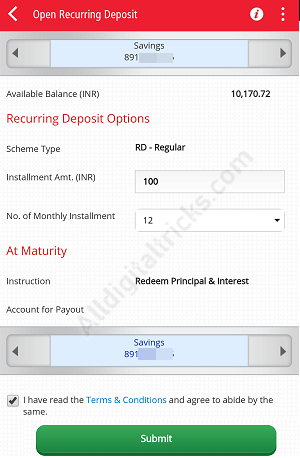 Next screen, choose Open Recurring Deposit. Now select your Debit account number, installment amount, No. of monthly investment and submit. Next screen you can see a summary of your RD account, you can see applicable interest rate. Tap on confirm. Done! 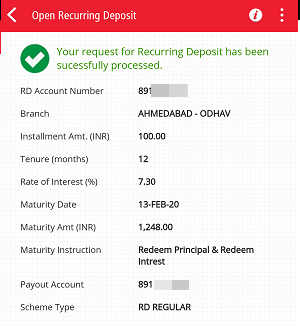 you have successfully opened RD account in Kotak Bank. First installment amount will be debited from your account. The date of your monthly Recurring Deposit installment will be the same as on the date of your first installment debit. The installment amount will be automatically Debited from your saving account. Login to Kotak Internet Banking. Now click on Banking tan and choose Open A Fixed/Recurring Deposit. Select your source saving account (installment will be debited from this account), enter RD amount, select tenure, you can also choose the nominee. Now submit your request. Recurring Deposit can be opened for a minimum of Rs.100/- and for maximum of Rs.1,00,000/- in multiples of 100. You can also register a nominee online. Interest on Recurring Deposits will be calculated by the bank in accordance with the methodology advised by Indian Banks’ Association.